Is The Entertainment Industry And Texting A Fit? Can the entertainment industry and texting go together? Although the entertainment industry encompasses a wide range of venues, text message marketing, or texting, is a perfect fit for most of them. When you think of concert promotion, musicians and bands promoting themselves, and nightclubs, for example, what do all of their customers have in common? They all carry mobile phones with them. Even though the audience is often told to turn their cell phones off at concerts, plays, and other events, the audiences are probably texting during the show anyway. So many wise promoters are taking advantage of the situation and engaging their audiences with texting during the event. 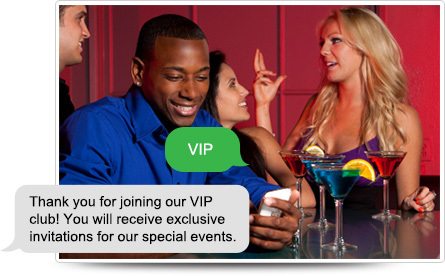 The DJ announces that everyone is welcome to join their VIP Mobile Club by texting a keyword to 63566, and they will instantly receive a 2 for 1 drink special. The lead singer in the band tells the audience to text the name of the band to 63566 and they will get T-shirts and other memorabilia for 25% off when they're leaving the concert. A concert promoter sees that ticket sales for a future concert aren't going as well as expected, so he blasts a text message to the audience reminding them of the up-coming concert. If you're at all involved in the entertainment industry, those examples should have gotten your creative juices flowing. Just think of how sending text messages can be used to promote events, promote musicians, promote a nightclub, and sell or give away merchandise like CD's, tickets, and clothing. Be sure to add our widget registration form to your website or Facebook page, too. Now your visitors and fans can enter their phone number and join your list of mobile users right there. You must give them something they find highly valuable in return for their number, but that shouldn't be difficult in the entertainment industry. Remember, once you've built a list of customers or fans, you can send messages to them whenever you want to. These can be reminders, notices of cancellations, free songs, special deals, last-minute announcements, or contests. It's common knowledge in the marketing world that "the money is in the list." Recently Hooters held a contest where customers who sent the word KENNY to their short code were entered to win an all expense paid trip to Boston to see a Kenny Chesney concert. Hooters reported that the response was overwhelming, and the whole promotion was a huge success. Plus, they now have all those phone numbers to promote to in the future. We have found that the entertainment industry and texting go together extremely well. Whether you're a concert promoter, a nightclub owner, or an independent musician, you often have access to a captive audience, and our text messaging platform allows you to communicate with them instantly to capture their phone numbers for future marketing campaigns. Your competitors are beginning to use texting, and if you don't you'll soon find yourself playing catch-up. Our services give you a very cost-effective way to get on board with this rapidly growing technology that easily combines the entertainment industry and texting.